The eye is the most important sensory organ of our body. Sight is a complex phenomenon, one which requires the eye to intercept, focus and interpret the images. 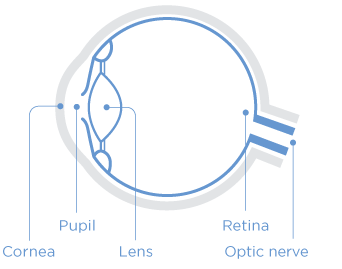 The cornea and lens cast images on the retina. The retina is a thin membrane which lines the back of the eye, converting light impulses into nerve impulses. These impulses travel along the optic nerve to the brain, which then decodes it into an image. 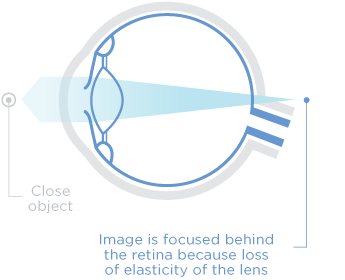 The optical system of a normal eye (cornea and lens) effortlessly focuses distant images on the retina. But for close-up images, the eye must make an effort to bring them into focus: this process is called accommodation. 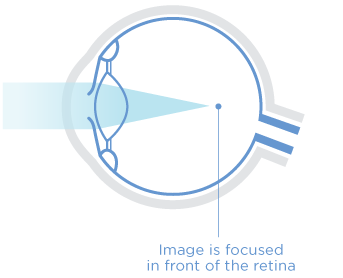 Vision is blurred when the focus point moves in front or behind the retina. The units of measurements for these refraction errors are called diopters. Characterized by the difficulty of seeing distant objects. The focus is in front of the retina. The myopic eye is usually longer than normal and has a steep cornea. The focus of the image is therefore cast in front of the retina, making far away objects appear blurry. People with myopia see objects better up close rather than far away. Characterized by the difficulty of seeing objects that are close. 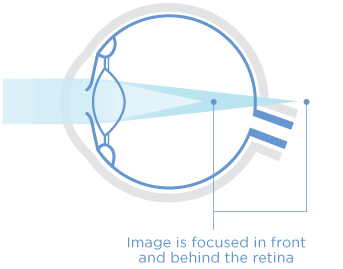 The focus is behind the retina. The hyperopic eye is usually smaller than normal and has a flat cornea. The image is therefore cast behind the retina, making near objects fall out of focus. People with hyperopia see objects far away better than up close. Characterized by blurred vision for both distant and near objects. 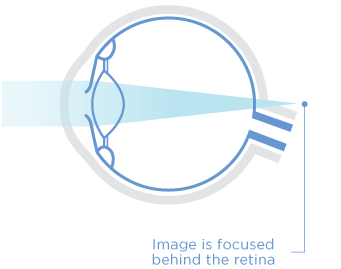 The focus is in front of or behind the retina. The astigmatic eye had a corneal surface with different curvatures. Rather than being spherical in shape, the cornea is steeper in one meridian (shaped like a football). Images are therefore cast in front of and behind the retina, making far away and near objects appear blurry. People with astigmatism have difficulty seeing up close and far away. With age, the lens loses its ability to accommodate, preventing the eye from properly seeing objects up close. It is normal for people in their forties to experience difficulty reading and to require reading glasses. This refraction error can be corrected at Invisia. People with presbyopia have difficulty seeing up close (e.g., reading a menu in a restaurant).